Interview Stephen Shore on New York Minute and From Galilee to the Negev Stephen Shore speaks to photo-eye's Melanie McWhorter about his two books published by Phaidon — New York Minute, the photographer's first iBook, and From Galilee to the Negev, a commissioned project that brought him to Israel and the West Bank. by Stephen Shore. Published by Phaidon. 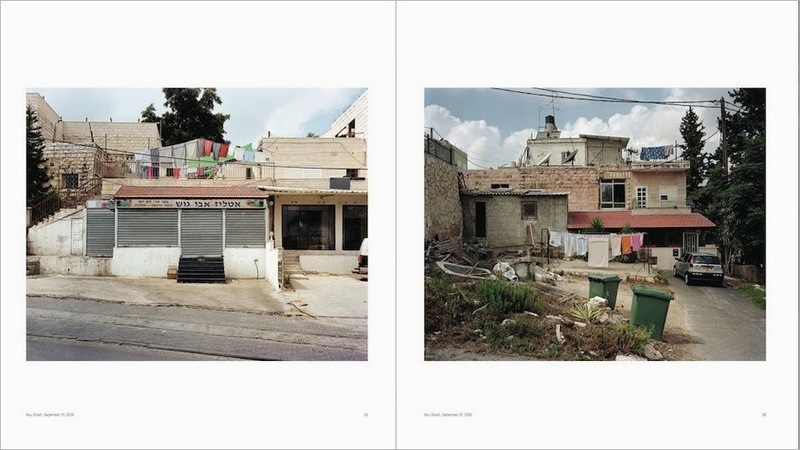 New from Phaidon are two publications by Stephen Shore. Available now, A New York Minute is the first digital book from both the photographer and publisher. While referencing the traditional photobook, Shore engaged the unique multimedia format of the digital book by creating 16 moving images contained in a static frame, catching fragments of the nonstop bustle of New York or details easily lost in the relentless movement of the city. The "still photographs flowing in time," as Shore calls them, give new dimension to his photographic vision while also connecting to his early film work. A New York Minute follows another experimental photobook project for Shore, The Book of Books, a limited edition two volume set containing five years of Shore's print-on-demand books, all photographed and created in a single day. Shore states: "The Book of Books was ridiculously expensive, extraordinarily expensive, and to make up for it the next thing that Phaidon released of mine is only $8.99." A new digital book is already in the works. 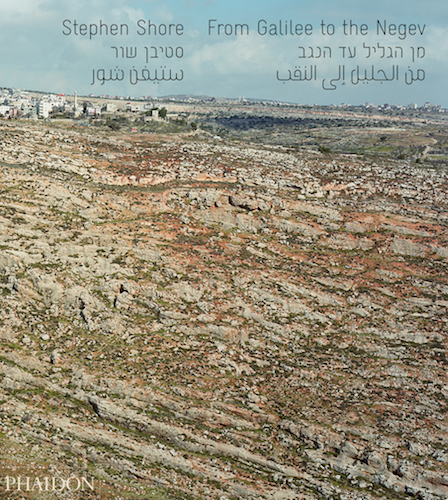 Due this Spring, From Galilee to the Negev is Shore's contribution a commissioned project organized by Frederic Brenner that brought an impressive roster of photographers to Israel and the West Bank to visit, explore and ultimately make a photobook. In the 2011 New York Times article Brenner is quoted as saying, "I did not bring people here to see the land of milk and honey. I brought them here to see the land that devours its inhabitants." With the form of each project left to the photographer, the overall agenda seem simply to provide an uncommon view of Israel and the West Bank as seen through the lenses of independent photographers, collectively creating a multifaceted vision worthy of the beauty and complexities of the place. 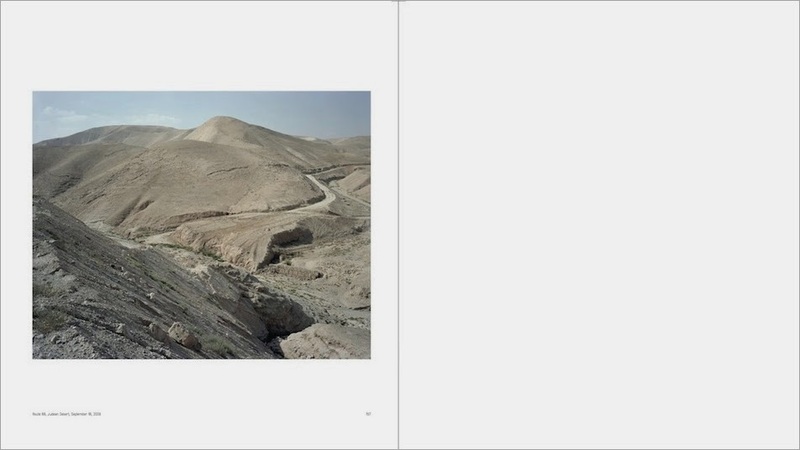 The first book of images from this commission, Field Trip by Martin Kollar, was published in 2013 by MACK. In his review for photo-eye Blog, Tom Leininger writes, "This book does not tell me what to think of the situation in Israel. It does not clarify the problems, but clearly there are issues. Field Trip is a book that presents an idea of Israel that is unexpected and jarring." Shore considers the work he produce for the commission to be some of his best — a sentiment he feels is true for many of the photographers involved. 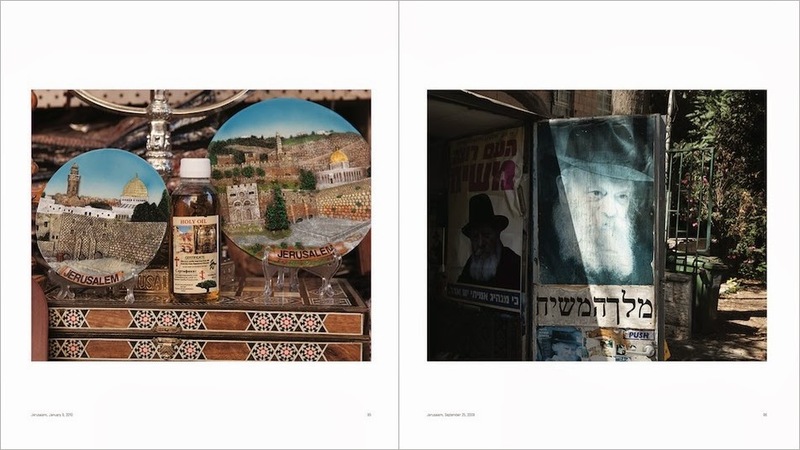 A New York Minute and From Galilee to the Negev can be ordered through photo-eye, with signed copies of From Galilee to the Negev available for pre-order. 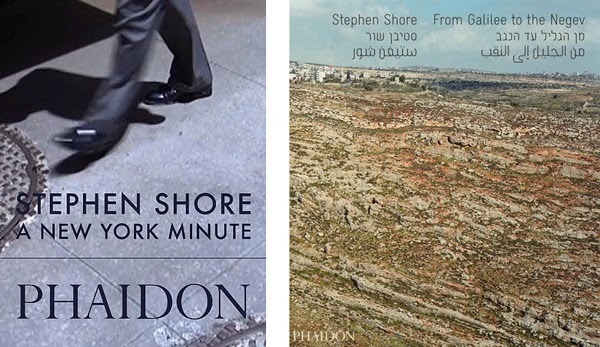 We're also happy to share with you a special deal from Phaidon — the first 10 orders of From Galilee to the Negev will receive a free download of A New York Minute. * photo-eye's Melanie McWhorter spoke to Shore about both of these new publications. 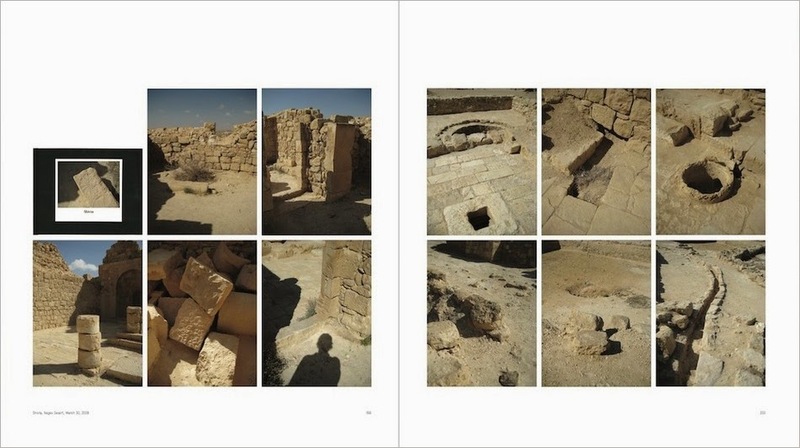 From Galilee to the Negev by Stephen Shore. Published by Phaidon. Melanie McWhorter: The first of your new Phaidon publications, a digital book called A New York Minute, was just released in November 2013. Although film is not new to you as you photographed with Super 8, what prompted this new film project? Is it a revisitation of the older film work? Stephen Shore: What prompted it was just the availability of this form. I'd been looking at digital books, and most of them — really all that I had seen — were just digital versions of printed books. Online, most newspapers now — or the better newspapers — have video content and their online version is an expansion of the printed version, not just a replica of it. I wanted to do something as a digital book that could only exist as a digital book. The form of a moving image that is a static image — there's no camera movement — does in a way harken back to the film I made in 1971 called Intersections. The first half of the film is very much like that, it's scenes of intersections with no camera movement, so I think there's a direct relationship to something I'd done a long time ago, but it really grew out of the idea of what can I do with this form. The book is laid out in a very conservative photobook style. One picture to a page surrounded by white. I wanted to have the look of a photography book but with an image that could move. MM: How did you choose the sequence and editing when you were laying out the films and how did that relate to how you would normally do it with a traditional photobook? SS: I think it was really very similar. There wasn't an exact plan with it. There are three scenes that are very similar which are people coming out of the subway. I wanted to have something that repeats, something later in the book that harkens back to something you saw earlier, but also interweaves the shots of the people walking on the streets with the more still-life kind of scenes. A New York Minute by Stephen Shore. Published by Phaidon. MM: There are a couple of them that are very similar to your still images. Were you conflicted when you were shooting those? Did you want to shoot actual film? MM: Was there a particular order for the films? Did you try to arrange it like you were flipping through an actual printed publication or did you want to make it into something totally different — a different type of vehicle for the imagery? SS: The other model I had for it were my print-on-demand books, which are also laid out the same way and have roughly the same number of pages, so I saw it as like one of those books except with moving images. I didn't have something specific in mind about the sequencing; it's not narrative. It's done very much the way I would do one of the print-on-demand books. I have the different clips and I move them around and come up with an order that makes sense but isn't somehow too specific, doesn't become narrative. MM: You did a very large publication with Phaidon called Book of Books that was made from a series of print-on-demand books. How did you start using the digital book format and what are you experimenting with now? SS: The print-on-demand book project is over so I don't see myself doing any more of those. I'm interested in continuing with the digital book. I think now that we've worked out the template for it and the technology for it, I think it's quiet possible I may be doing more of them. MM: Would they replace any of your printed books? SS: No, I don't see myself doing any stills in a digital book. I want to do something that is unique and appropriate to the format. MM: Switching back to traditional books, Phaidon is publishing your work from a commissioned project in Israel and the West Bank. From the video trailer on the work, you state that you did not feel the pressure to have a comprehensive view of the country since there were also 11 other photographers working as well. How did you choose how you would approach Israel? Was this a decision that you made before or after entering the country? SS: All the photographers had exploratory trips for a couple of weeks before we started shooting, often many months before, where we traveled all over the country, had interviews with different people, with a range of people. It was fascinating the kind of program that was set up. One morning I spent half the day in Hebron with the leading Palestinian human rights activist and then in the afternoon met with a man from an Israeli think tank. We were buffeted in a way by the different layers of what's going on there. And this was, I think, to help us really get an idea of how we were going to proceed. One of the things I wanted to get at was a sense of the land. It was very moving. It's not exactly beautiful; it's very raw. Parts of it are beautiful, but I wanted to give an almost topographical sense of what the place looked like. I had several different projects that went on at once. That was one of them, another was just scenes of everyday life as I like to do, that would occasionally touch on conflict but not focus on it. In fact life there isn't only about the conflict. The third project was a much smaller finite one, which was photographing sacred stones. All the different cultures there seem to focus on particular stones and rocks that are venerated. The earliest one was a small monolith at a Canaanite high place that was perhaps more than 2500 years old. I photographed inside the dome of the rock; there's a rock cave under it where Mohammad prayed. I photographed a rock outside of Hebron that was supposed to have the footprints of Abraham, who was obviously the patriarch of Jews and Arabs. Obviously the Kotel, the Western Wall, the Church of the Ascension with the rock on which Jesus supposedly stood before he ascended to heaven, the anointing stone where his body was laid after crucifixion — so that was a very specific project, and I did it in a different way. I was using 8x10 black and white. The landscape work was 8x10 color, and the scenes of daily life were shot digitally. 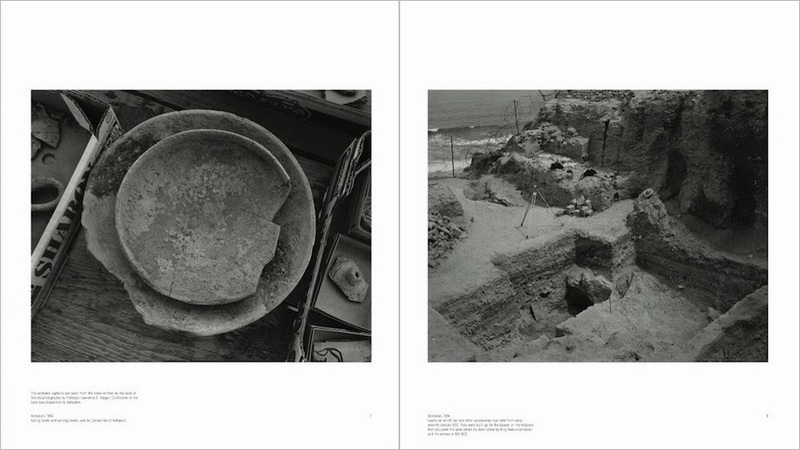 SS: There's one other project that's included in the book that I didn't shoot during this sequence of trips, but I'd been to Israel in the mid-90s and went on two archeological digs, and so Phaidon and I didn't see this book as being confined to the work I was doing in Israel and the West Bank for this project. We're incorporating some of the pictures I shot in the 90s on these archaeological digs. MM: You say in the trailer that you think the work you produced there is extraordinary, and that many of the other photographers also produced extraordinary work, making this possibly one of the best projects ever commissioned. What do you think was your reason for that? Was the location so exotic, is it the history of place or something else? SS: I think that for this kind of commission, for it to be really successful it has to fall at a particular time in the creative cycle of an artist. And it just for me was the right project at the right time. It wasn't just the place that I found inspiring it was a combination of things. It was the first time I spent an extended period of time using a particular high-end digital camera that I feel in love with and that I felt expanded what I could do as a photographer. And it was at a point where I had gone through five years of doing the print-on-demand books and was in a new place and I was ready for something to happen. And this came at just the right time. I think there have been a number of other photographers in the project who have done some of the best work I've seen of theirs. One of the first names that comes to mind is Fazal Sheikh — extraordinary work. Wendy Ewald's work— I don't even want to start listing because so many of the people really produced extraordinary work. MM: Will the images be presented as an exhibition? SS: The work will be an exhibition that will open I believe in Prague next September, and the photographers include Josef Koudelka, Rosalind Solomon, Jeff Wall, Thomas Struth, Nick Waplington, Jungjin Lee, Martin Kollar, Gilles Peress, and the man who put the project together, Frederic Brenner, who also I think has done the best work I've seen of his. MM: The essays in the book are outstanding. How did you and Phaidon select writers and what was the tone that you wanted to set or what information did you want to convey about this area? SS: One thing I didn't want — I think there were two things I didn't want — I didn't want an essay about me and my photography. All of the essays really were meant to be about Israel and the West Bank. The second thing is I didn't want a lot of general polemical writing. What I was after was for people to pick particular pictures that they responded to and write about that picture. In some cases it leads to more general reflection but in some cases it unlocks some of the visual coding in a way, cultural coding that's in the picture. For example, the one you asked about, that's talking about the conflict with the ultra orthodox protesting against some archeological digs, especially when they're coming upon human remains. You could see the archeological pictures, and then we have a poster from the streets in Jerusalem, a picture of this poster which has pictures of archeological digs and writing about this very issue, and if you don't read Hebrew there's no way to know what this is. So that's what that essay you refer to is about, it's talking about this conflict that this poster is a polemic for. It was photographed in an ultra orthodox neighborhood, but it also puts some of the archeological dig pictures in a different context, so I guess that's a clear example of what I'm talking about. MM: In the essay by Eyal Weizman, he mentions that despite the government minders on an aerial tour, you were able to capture an image that “escapes the official control and that you found a counter narrative to record.” In another quotation, essayist Jane Kramer calls your aerial images "benignly distant from the problems on the ground." These two quotations and other illustrations in the texts present the duality that is Israel and the West Bank. Do you feel that your images share the complexity? Do they represent the many faces of this area? SS: That's what I'm hoping for. Some of the aerial shots don't have any habitation, it's just land. But then there are some where you can see the remains of habitation, old stone walls and old foundations. What I mean when I talk about unlocking the meanings of the pictures, some of the cultural references of the pictures and social references, Weizman's doing that. These could be archeological ruins, you wouldn't even know how to read it, but he's interpreting it that these are in fact the remains of Palestinian villages that were destroyed during the 1948 War. And there was no way that someone who is not really steeped in that history would necessarily know that from the picture. This work is problematic. Would Stephen Shore have accepted an invite to apartheid South Africa in the early 80's, I wonder? Another Stephen - Stephen Hawking - declined a recent invite and I think he made the right choice.